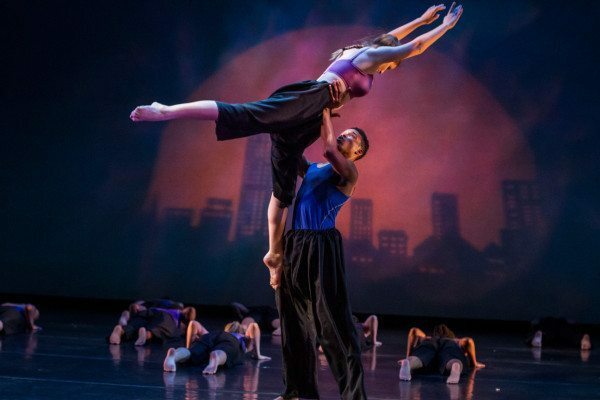 The Appalachian Dance Ensemble will present their spring concert in the Schaefer Center for the Performing Arts on the Appalachian State University campus at 7:30 p.m. Thursday through Saturday, April 7–9. The event offers a mix of faculty and student choreographed dances, with an upbeat array of styles to suit all dance lovers. Faculty and student work will again be on display during the Spring Appalachian Dance Ensemble, with performances April 7 – 9 in the Schaefer Center for the Performing Arts on the Appalachian State University campus. Pictured from the most recent concert are Raquelle Pollock, left, and Lea Vosberg from “Centripetal,” choreographed by Kathryn Ullom with movement contributions by the dancers. Photo credit: Jamille Wallick. According to concert coordinator Marianne Adams, there will be modern dance, contemporary ballet, hip-hop, dance/theatre and tap within the program of eight dances. Faculty members Cara Hagan, Regina Gulick, Susan Lutz and Kevin Warner, the new chair of the Theatre and Dance department, will contribute dances for the concert, while dance students Juliet Irving, Darius Gregory, Jason Dawkins and Kai Des Etages were selected to create original choreography. Theatre faculty members John Marty and Mike Helms will create lighting design and mentor student designers Lizzie Vazquez and Kevin Pehush. Associate Professor Sue Williams will provide costume design, oversight and costume support for the show. Sarah Collins, an elementary education major and dance minor, will be the stage manager. Ticket prices start at just $10 for students and faculty and only $17 for adults. For more information, visithttp://theatreanddance.appstate.edu, contact the box office at 828-262-4046 or call the toll-free number 800-841-ARTS (2787). Tickets will also be sold at the door one hour in advance of each performance. The Schaefer Center for the Performing Arts is located at 733 Rivers Street. After 5:00 p.m. on weekdays, and at all times on weekends, Schaefer Center patrons may use any available parking lot on campus. The Raley and Edwin Duncan parking lots are across Rivers Street and accessible through traffic light directly in front of the center. The stadium lot is behind the center and accessible from Stadium Drive. Covered parking is available at both the Rivers Street Parking Deck and the College Street Parking Deck. The Department of Theatre and Dance is housed in the College of Fine and Applied Arts. Its mission is to provide liberal arts educations for the B.S. degree in teaching theatre arts and the B.A. degrees in dance studies or theatre arts. The department also values the opportunity to offer coursework for integrated learning through the arts to the general university student population. Vital to the support of this mission is a dynamic co-curricular production program that provides exemplary theatre and dance experiences to departmental students, the university community and the region. The departmental philosophy is to support the university’s liberal arts environment through a balanced and integrated emphasis on teaching, creative activity, scholarship and service.